To celebrate the release of Star Trek: Into Darkness this month, we’ll be running through the first season of the classic Star Trek all this month. Check back daily to get ready to boldly go. It’s only logical. Still, Roddenberry was always an excellent salesman, and his script for The Menagerie brings out that quality in abundance. The Menagerie is effectively an excuse for why the show ran out of original scripts half-way through its first year, and Roddenberry might not make the most convincing argument, but he still makes it compelling. Indeed, Roddenberry’s strengths and weaknesses are on full display here. We even get William Shatner stepping into the role of the show’s continuity announcer, providing voice-over narration in his logs that sounds like Roddenberry was writing the show’s trailers rather than the show itself. Apparently Kirk isn’t documenting The Menagerie to provide a full and accurate account of the adventure to his superiors. He’s just enjoying keeping everybody in suspense. “Why?” he asks, as if teaching a course in writing on the side. “Why does Spock want to take to that forbidden world his former captain. Mutilated by a recent space disaster, now a shell of a man, unable to speak or move?” It serves as a recap, but Roddenberry is rather shamelessly (and clumsily) ratcheting up the suspense. It’s not the most elegant way of trying to excite the viewer, but it’s direct enough to work. Naturally, Kirk ends his little narration without answering any of these questions. 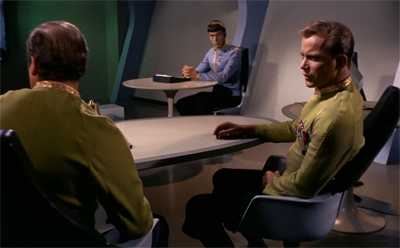 “The only answer Spock would give was on the hearing-room screen.” So we’ll have to tune in and find out! Okay, Star Trek hadn’t a lot of experiences with two-parters at this point. This was the first two-parter, and with would be twenty-four years before we got another. Considering that it was a two-part clip show, it’s a wonder that The Menagerie works at all. I actually find the first part of The Menagerie quite interesting viewing. It’s far from the season’s best, but it has a decent plot and some nice character work and world-building. There’s something quite interesting about logical Spock stealing the Enterprise to do right by his former commander. The Menagerie, Part II is a bit less interesting. For one thing, there’s a whole lot more clip footage. The plot was front-loaded, so this second part is mostly devoted to the rest of The Cage. We can all watch The Cage separately, and on its own terms, so The Menagerie, Part II has much less going for it than the first part. Very little of what we see here is developed or expanded by anything we discover in this episode – unlike, for example, Spock’s bond with Pike or General Order 7. Instead, The Menagerie, Part II is more driven by a desire to put The Cage on the screen than it is by the hope of telling a good story. Almost every single line of dialogue in the court room or action undertaken by the characters is an excuse to show more footage from The Cage, or to amp up audience excitement about that footage. Spock even refuses to give spoilers in his testimony, despite the fact that there’s a fairly compelling reason why he should. “You’re forgetting you’re on trial, Spock,” Mendez protests after one such evasion. “You will answer all questions put to you.” Spock responds, “My answer to your question would be quite unbelievable, sir. 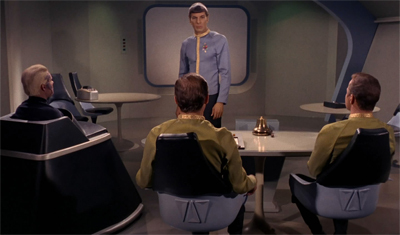 I regret we’ll have to wait and see it there.” I’m surprised Leonard Nimoy didn’t turn to the camera and add, “And that goes for you all, too.” While The Menagerie, Part I went to great deal of effort to set up a framing story, the second part isn’t interested in that at all. For another thing, Roddenberry has a bit of difficulty with resolutions. A lot of commentators argue that Star Trek has a bit of difficulty with the second part of two-part adventures, that it’s tough to neatly resolve all the necessary plot points in a satisfactory manner. I would not agree with this general assessment, but I think it’s fair here. 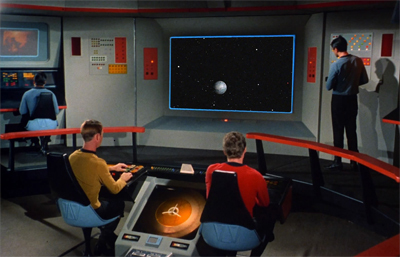 Roddenberry constructed a framing story that would provide an excuse to show the unaired pilot, buying the show two more episodes and the writing staff time to come up with the next story. However, it’s very clear that he had no idea how to end that story. 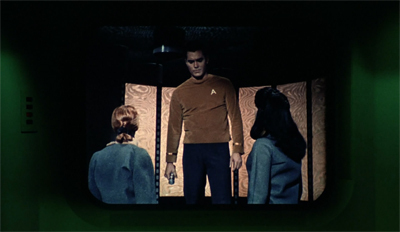 The resolution is so half-assed that Uhura delivers the exposition from off-screen. “Received images from Talos IV,” she reports from Starfleet Command. “In view of historic importance of Captain Pike in space exploration, General Order 7 prohibiting contact Talos IV is suspended this occasion. No action contemplated against Spock.” In short, it’s a ‘no harm, no foul’ ending, which just makes the whole thing a bit pointless. Of course, it seems like the whole show is running out of time here. 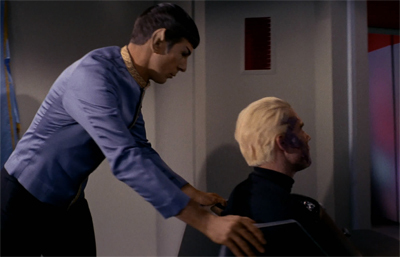 At the end of the episode, Spock has barely wheeled Pike out the door before the footage from the planet reveals that Pike is living happily ever after. It’s as if the finalé was running so tight for time that they couldn’t even edit in a cut or a scene transition. Given the powers of illusion demonstrated by the Talosians, that sort of footage would make me a bit uncomfortable. Yes, this image WAS used in my review of The Cage. Roddenberry’s not the only one who can recycle! That has some interesting implications. Apparently the Talosian powers of illusion can reach as far as Starbase 11, where Kirk boarded the shuttle with fake!Mendez. That’s a terrifying thought, the notion that the Talosians could reach into any mind within that sort of range. It almost makes General Order 7 seem a little bit useless. However, aside from all of that, it also seems a little manipulative and underhanded. 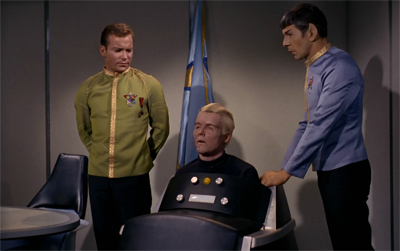 If that Talosians wanted to keep Kirk occupied, there must have been a better way than have him preside over a life-or-death hearing concerning his best friend. Which, appropriately, brings us around to the question of Chris Pike. I didn’t discuss Pike while talking about The Menagerie, Part I, and a lot of that was so that I would have something to talk about when it came to this hour, which is mostly devoted to the pre-existing footage. Given that Jeffrey Hunter wasn’t coming back, the use of Pike here is quite astute. It’s probably the most graceful actor swap in the history of the franchise. It also gives the show yet another iconic visual. The beeping wheelchair is absolutely absurd, but it’s one of those images that has embedded itself within the popular subconscious. It has been used for gags on Futurama and South Park, among others. Part of the appeal is how ridiculously and obscenely terrible the notion of being trapped inside that chair must be. 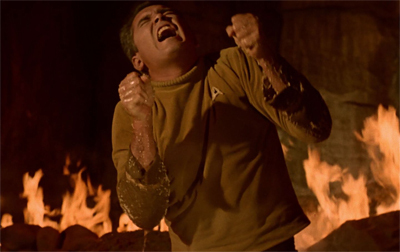 Star Trek has to create a situation where sending Pike to live a life of illusion must be the only possible happy ending for the character, so he needs to be put in a truly horrifying position. Stuck in a chair, able to communicate through one blink for “yes” and two blinks for “no” definitely qualifies. Any life with that sort of debilitating injury would be tough. As Mendez succinctly (if melodramatically) outlines, “His mind is as active as yours and mine, but it’s trapped inside a useless vegetating body. He’s kept alive mechanically, a battery-driven heart.” McCoy expands on that, “Now, that man can think any thought that we can, and love, hope, dream as much as we can, but he can’t reach out, and no one can reach in.” That is terrible. 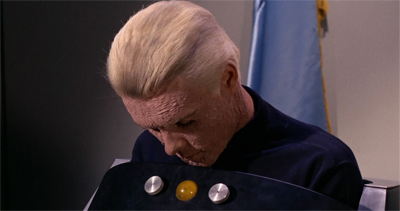 And the fact that Pike’s injuries were caused by a “rupture” on a Starfleet training vessel suggests that his circumstances are not unique. What happens to all those officers without a past involving the Talosians? The Menagerie needs Pike to be so gravely injured that he has no quality of life, but the implications are somewhat unsettling. It seems to suggest that the best thing to do with a person dealing with that sort of injury or illness is to off-load them, to accept that their quality of life cannot be improved and that there’s really no hope. Of course, none of this is intentional. It’s all just there by virtue of the story Roddenberry has chosen to tell. Even in-universe, it feels a bit weird to bring Pike to Talos. These are beings who, to quote Kirk, where “planning to breed a society of human slaves.” They lied to him, they manipulated him, they caused him pain. They only stopped because he refused to play along. Spock’s plan is to leave Pike in their care, unattended? Granted, the Delta Rays may have made him sterile, and thus scuttled their breeding programme, but it’s still a little creepy. The Talosians aren’t exactly the most moral creatures in the cosmos, and you’d imagine that creating an illusion of a high-ranking official to simply keep Kirk busy probably should have set off some alarm bells. Instead, the Enterprise (and Starfleet) seem relatively happy to be rid of Pike. He isn’t their problem any longer, so the ship can get back to exploration and ignore the petty business of caring for the sick and the injured. After all, General Order 7 was suspended in this case, not in every case. Starfleet can never check up on Pike, or confirm how the Talosians are treating him. Of course, even if they could, it would be impossible to trust any evidence of how Pike was being treated one way or the other. Ah well, best not to think too much about it. That way lies madness. There are some smaller nicer touches here. In particularly, Roddenberry seems to be really pushing Kirk as a bit of a player. He noticeably perks up when the Orion Slave Girl appears, prompting Mendez to explain, “They say no human male can resist them.” Kirk seems to accept this at face value, and it’s the only time Kirk seems engaged with the narrative, rather than simply asking plot-related questions. 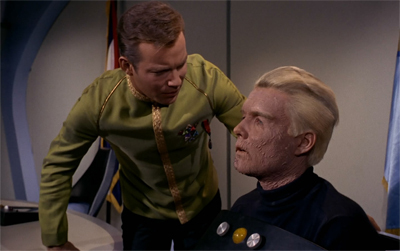 Indeed, in the same scene, his narration seems – perhaps – to be reading too much of himself into Pike, “Strange evidence from the past, how the Talosians, planning to breed a society of human slaves, tempted Captain Pike with the Earth woman they held in captivity. And as she appeared to him in many forms, each more exciting than the last, Pike was beginning to weaken.” Okay, it’s not an unsupported reading of events, but it is a completely redundant piece of dialogue that tells us more about Kirk’s mindset than about Pike. Kirk probably would have made a point to hook up with Vina before foiling the Talosians. The Menagerie isn’t a great episode. The Menagerie, Part II is considerably weaker than the first part. However, they aren’t a complete waste of space. It’s nice to see the show incorporate The Cage into its narrative, to establish the history of the Enterprise itself. 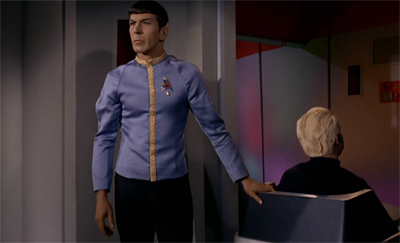 It’s also great to see a Spock-centric episode. While Roddenberry the writer has no idea how to resolve the stakes he raised in the first part, he does have enough ideas to keep things interesting. And that’s enough to stop the adventure from feeling completely wasted. Actually I found the Menagerie to be one of the strongest episodes of the original series. TV writing back in the 60’s as you know was far different than what it is today. Take for example Pike’s injuries. His demise was tragic and it made you think that starship captains are not immortal. Fast forward almost 50 years. Looking at injured Pike seems far fetched but back in the 60’s it was something you never saw before on TV and it was a shock. You can debate all you want how lame the 2 part episode was – I disagree. 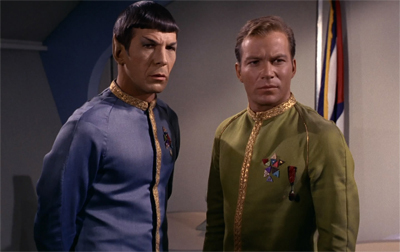 The Menagerie Parts 1 and 2 are on my top 10 best of trek tos episodes. That’s an interesting choice, one I’m not sure I’d entirely agree with personally.